Sony Hall is the new premiere music venue in New York City focused on presenting world renowned performing artists across all music genres, powered by state of the art technology. 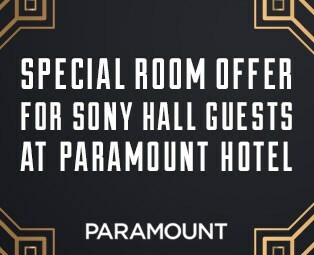 Owned/operated by Blue Note Entertainment Group and sponsored by Sony Corporation, Sony Hall is located in the heart of New York’s Theatre District (at the Paramount Hotel), with capacities of 1,000 standing and 500 seated, and a full-service restaurant and bar. Sony Hall is equipped with Sony’s technologies, integrated throughout the 12,000 square-foot venue to deliver enhanced entertainment experiences to fans. Sony’s proprietary multi-dimensional audio technology integrated within Sony Hall was developed to create a spatial audio experience. The system uses approximately 30 speakers allocated to the hall to realize the music experience where the performance of the artists, orchestras, and/or a band actually surrounds the audiences even it is being played by the recorded live performance.